Calling all actors - do not miss this groundbreaking live event! "No matter where you are in your acting career, there are always challenges. Shani’s experience, expertise, and passion for helping others are priceless. She is providing exactly what an actor needs to truly advance his or her acting career." Get your road map to grow your acting business with top Hollywood and local industry experts. If you are feeling stuck in your acting career...whether you are in the beginning stages and need an effective strategy forward, or a working actor but hit a wall and need a breakthrough, or have been working consistently and need to take everything you are doing in your acting career to the next level...this event focuses on effectively approaching your acting career like a business, while simultaneously focussing on your purpose, being a balanced actor, and being completely whole - mentally, physically, spiritually, and emotionally. Join us and discover exactly how you should be spending your time, resources, and energy to go to that next level of your life and career. Move out of the confusion of trying to figure it all out on your own, or the frustration of not seeing the results you desire, and leave the day knowing exactly what is holding you back and exactly how to push through to the next level. The day will be packed with priceless information, transformative exercises, strategy building, and breakthroughs. Including a distinguished industry panel with both local and Hollywood industry guests (our last event panel included actor/director Kevin McKidd (Grey’s Anatomy, Rome, Journeyman) and Director Ken Whittingham (Modern Family, Parks and Rec, 30 Rock, The Office)). Our event is designed to give you the information, tools, knowledge, strategy and resources you need - placing the power in your hands to effectively and consistently create your own breakthrough opportunities. We highlight the crucial topics needed to thrive not only in your acting career, but in your life as a whole. During this full day event, you will grow far beyond your current limits, create an effective strategy that propels you forward, and develop the kind of mindset that breeds success. Also, as a special bonus all of our attendees are invited to attend the private roof top party at Century Club immediately following the event. 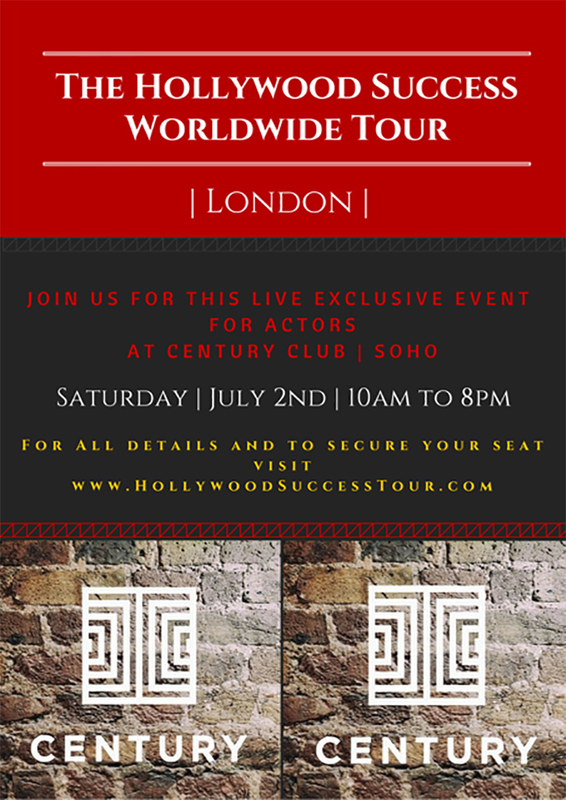 Info: The Hollywood Success Worldwide Tour - London will be at the exclusive Century Private Member’s Club in Soho on 2 July 2016 | 10am to 8pm / book tickets / Enter the promo code AFRIDIZIAK when checking out and gain the opportunity to bring an actor friend for FREE! This allows you both to share the cost, share the experience, and attend this event for less than £68. Visit the website for all event details and to secure your seat. Space is very limited and likely to sell out.